Henge Docks, known for its range of docks for Apple's line of notebooks and iOS devices, today introduced new docking stations designed for the 2016 MacBook Pro. There are a total of three new docks: the Tethered Docking Station, the Vertical Docking Station, and the Horizontal Docking Station. 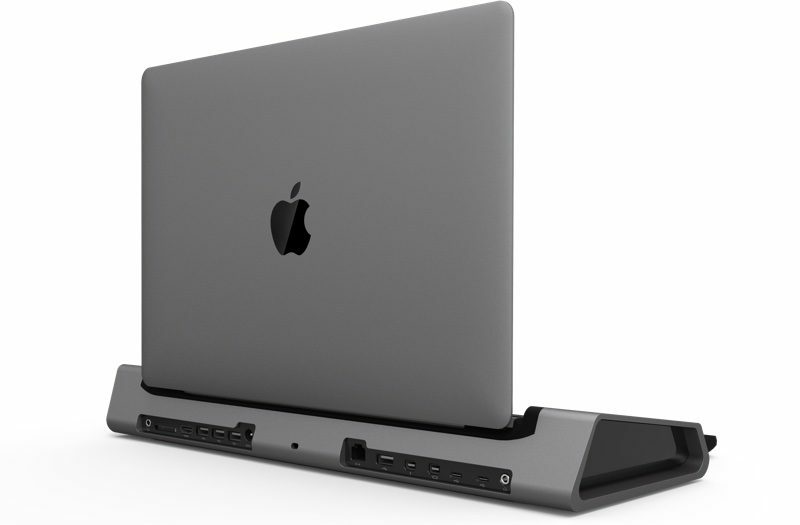 The Tethered Docking Station, available in Space Gray, is designed to be an extension of the MacBook Pro, with an 85-watt power supply, three USB Type-A ports, two Mini DisplayPorts, an SD card slot, a Gigabit Ethernet port, an audio port, and support for USB-C or Thunderbolt 3 (there are two models). An angled design allows the MacBook to rest directly on the dock. 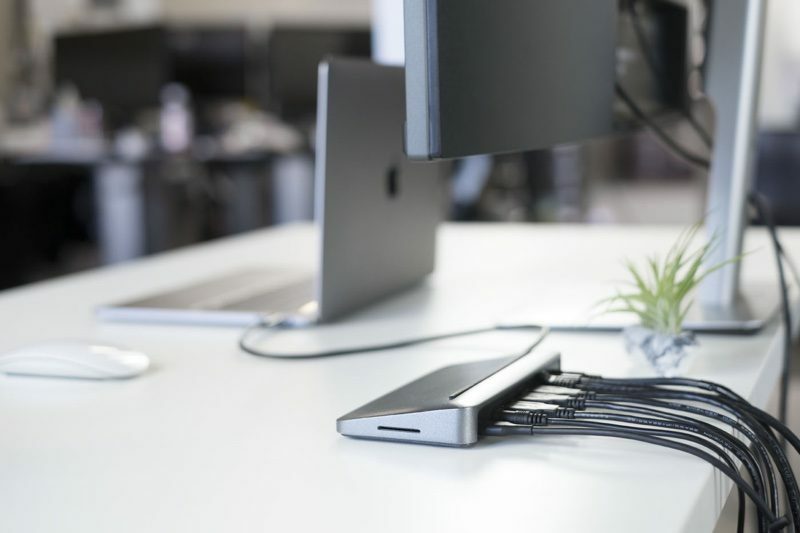 The Vertical Docking Station, also available in Space Gray, includes pass-through connections for USB-C or Thunderbolt 3, allowing customers to dock their MacBook Pros and have an instant connection to peripheral devices. Designed to pair with the Tethered Docking Station, the Vertical Docking Station is available for all three MacBook Pro models. The Horizontal Docking Station is an all-in-one-dock that features 13 ports and the ability to drop your MacBook in place to have immediate access to all of your accessories. It features 85-watt power, support for up to four external displays, multiple USB Type-A ports, an SD card slot, and more. 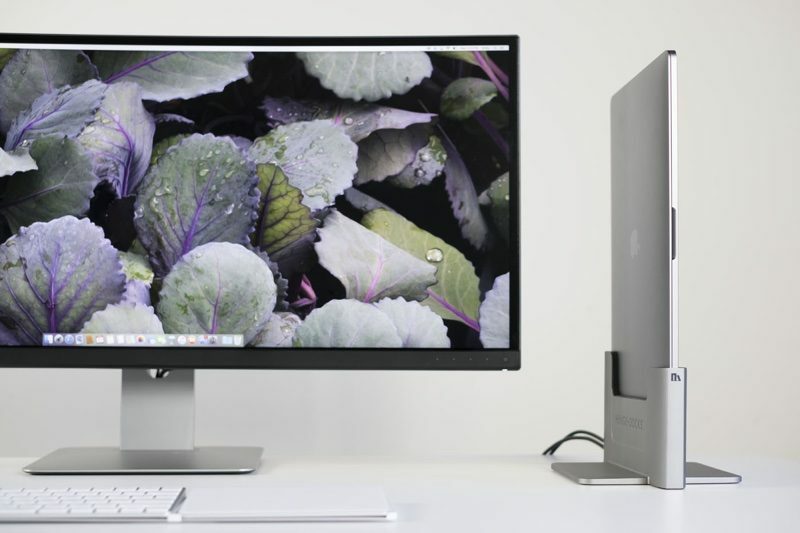 Like the other docks, it is available with either Thunderbolt 3 or USB-C support. Henge is also announcing a new partnership with Apple, which will see it becoming an Apple Authorized Business Solution Provider. Henge can now sell bundles that include Apple MacBooks and Henge docking stations, and plans to introduce a variety of options that can save customers up to $150. Bundles will range from the Clique paired with an Apple Magic Trackpad 2 and Apple Magic Keyboard to a new MacBook Pro paired with a Horizontal Docking Station. "This partnership, coupled with the new products we are launching, allows us to offer our customers a complete workstation setup in one convenient spot, and at a discounted price," said Matthew Vroom, Henge Docks CEO. "It's an honor that we were selected for this program after having worked so hard to build products designed to complement and enhance the Apple user experience." All of the docks will be available during the spring of 2017. The Vertical Docking Station will be available for $149, while pricing for the Tethered Docking Station and Horizontal Docking Station will start at $199 and $499, respectively. These are nice docks. Either way I am passing on the MBP for now until there is at least 32gb RAM and they improve the battery life. Apple Authorized Business Solutions Partner. Sounds like a partnership for money, and the new MacBook Pro was made perfectly for this dock and partnership to exist. I love my new laptop, but news like this makes me cringe a bit inside. Don't understand how people don't find this better than having loads of cables coming from their laptop. Eff that. One USB c cable to a hub or docking station is way better. And in a year or two everything will USB-C anyway. And a price reduction wouldn't be bad either. Henge ('https://hengedocks.com'), known for its range of docks for Apple's line of notebooks and iOS devices, today introduced new docking stations designed for the 2016 MacBook Pro. There are a total of three new docks: the Tethered Docking Station, the Vertical Docking Station, and the Horizontal Docking Station. Bundles will range from the Clique paired with an Apple Magic Trackpad 2 and Apple Magic Keyboard to a new MacBook Pro paired with a Horizontal Docking Station.The Tethered Docking Station will be available in March of 2017 for $199, the Vertical Docking Station will be available in the Spring of 2017 for $149, and the Horizontal Docking Station, also available in the Spring of 2017, will be priced at $499. [doublepost=1483667140][/doublepost]I wonder if the vertical dock might impair cooling. The lack of charging or hub is disappointing for the vertical one. - It might also be due to the incompatibility with a certain chipset and certain devices in the new machines. If it is, there's a software patch for it. Nice :) Especially when they could've tried to upsell you to a completely new one. It's actions like this that make them a brand to recommend. Astute observation, and I didn't think about that. It's true, the more generic things have a longer life cycle. I've re-used my USB 3.0 hub just by replacing the cable to the laptop. You can't do that with the hubs that have captive cables. Woo boy, the horizontal dock is $499. Wow... Is it made from gold-plated latinum? Personally I prop up my laptop on a 10 year old but still sturdy Kensington stand. I've got three USB-C cables: monitor, power and cheap hub. You can spend a lot of money but it's definitely not a necessity.